MoDOT uses a procurement process called Job Order Contracting (JOC) for traditional on-call maintenance repair contracts, including asphalt and concrete pavement repair, guardrail and guard cable repair, bridge repair and fence repair. JOC allows MoDOT to award fixed price construction contracts with indefinite delivery and indefinite quantity at individual work locations throughout the project limits. The JOC bid proposals contain a catalog of pre-established fixed unit prices for material, equipment and labor for various items of work to be used for completing each job order. The contractor bids adjustment factors for the expected overhead and profit and any additional business and construction related costs for performing the various types of work identified in the contract. The fixed unit prices in the bid proposal allow the contractor to determine the adjustment factor (profit and overhead) that needs to be bid up front without knowing the quantities, schedules or timing of the work orders. Job Order Contracts are awarded based on the lowest responsive bidder. Overall, Job Order Contracting eliminates the ability for contractors to unbalance the bid. The JOC bid proposal must specify the maximum program budget to be awarded during a specified contract term. MoDOT is not bound, however, to issue a minimum or maximum number of job orders during the contract term. It is MoDOT’s overall intent though to meet the anticipated budget specified in the contract. Contact Bidding and Contract, for additional guidance. A fixed unit price list containing unit prices for the various items of work for each job order is included in the JOC bid proposal. Fixed unit prices are for complete and in-place construction, including all labor, equipment and material required to complete the construction task. All labor, material, equipment and work required by a specification shall be considered part of the fixed unit price, unless otherwise stated elsewhere in the contract. Adjustment factors include business and construction related costs as defined below. It is the responsibility of the contractor to verify the fixed unit prices provided in the contract and to modify their bid for the adjustment factors accordingly. e.	fringe benefits, payroll taxes, worker’s compensation, insurance costs and any other payment mandated by law in connection with labor that exceeds the labor rate allowances. f.	business risks such as the risk of low than expected volumes of work, smaller than anticipated job orders, poor subcontractor performance, and inflation or material cost fluctuations. h.	any other discreet items of work required to complete a particular job order. General Costs. The above lists are not exhaustive and are intended to provide general examples of cost items to be included in the contractor’s Adjustment Factors as defined in the contract. MoDOT Bidding and Contract Services (BCS) conducts an annual internal MoDOT meeting to discuss lessons learned from previous year’s on-call contracts. Design staff incorporates changes into the next years contracts, and updates the job special provision (JSP) templates for distribution to the districts. The BCS section also updates the fixed costs to reflect the new market value. In the event the costs change significantly, the BCS section coordinates with industry to ensure the fixed costs are satisfactory. The fixed costs in the draft proposals should not be adjusted by the districts, without prior input from the BCS section. It is important to have agreement on the fixed unit price list with industry to eliminate any outliers that could cause contractors to bid risk in the factors. In addition, no additional items of work should be added without first coordinating with the BCS section. Our experience to date has shown that adding specialty items of work may discourage contractors from bidding on a typical maintenance contract because the specialty work has to be subcontracted out for additional costs. Many times, specialty items of work or items of work not identified in the list of fixed costs are better managed by negotiating a price with the JOC contractor. Establishment of pricing for any non-fixed cost pay items will be in accordance with Sec 109.4.2 or 109.4.3 of the Missouri Standard Specifications for Highway Construction. If no agreement to pricing can be made then the work will proceed with payment for non-fixed cost items under Sec 109.4.4. The JOC contracts include contractor-furnished Traffic Control Plans (TCP) as on option, but the district may choose to provide the traffic control with MoDOT forces depending on availability. Example TCP plans for the Job Order Contracts exist as seed files in ProjectWise. These example plans are based on what has been used on past contracts and are for example purposes only. Some of the traffic control scenarios may not apply to all districts so each district should ensure changes to the Traffic Control Plans are also changed in the JSP template. 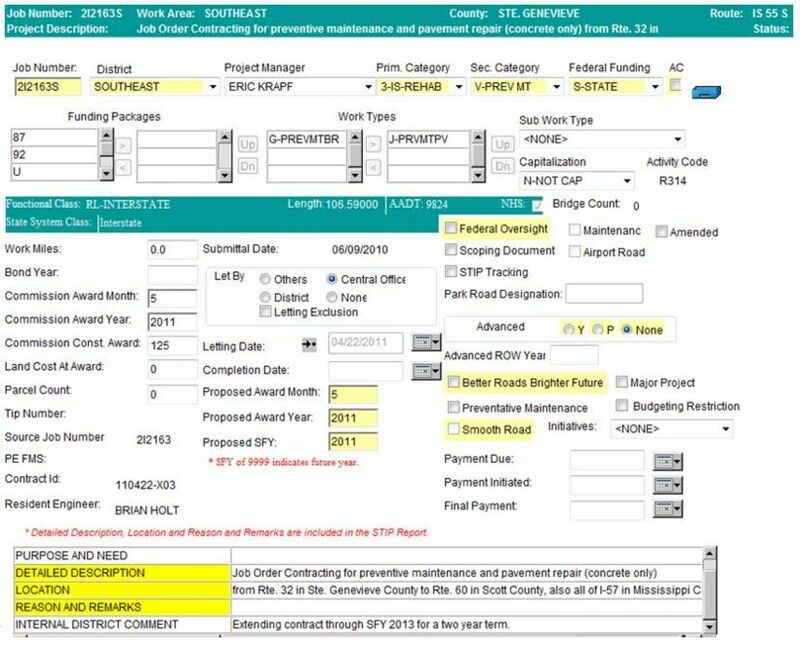 If there are revisions to the JSP template, the district should identify the revisions to the BCS section at the time of Plans, Specifications & Estimate (PS&E) submittal. 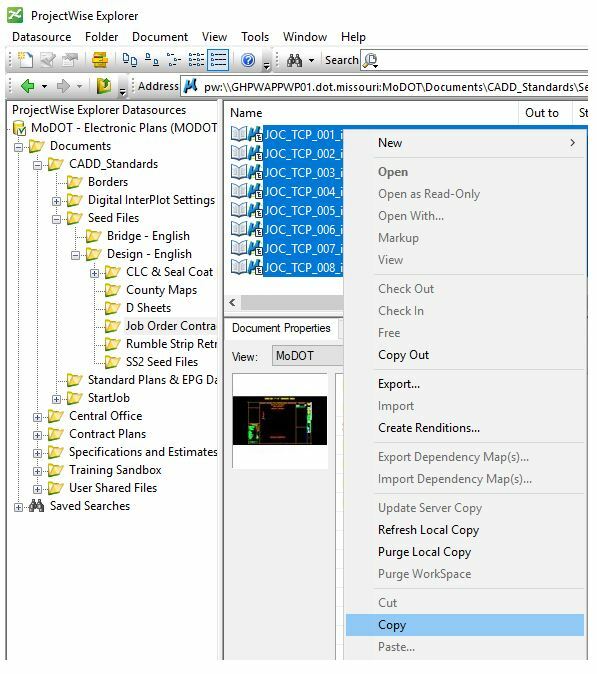 The JOC_TCP files are located at pw:\\GHPWAPPWP01.dot.missouri:MoDOT\Documents\CADD_Standards\Seed Files\Design - English\Job Order Contracting\. All district ProjectWise users will have read-only access to the files. Select all of the files, right-click and select Copy. Then right-click in the job directory and select Paste. 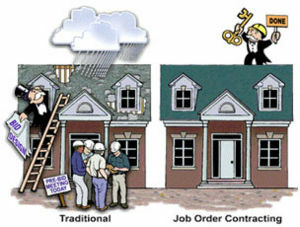 The engineer will collaborate with the contractor when developing an individual job order. At any given time the contractor may be performing more than one job order. The total cost of an individual job order will be determined by multiplying the fixed unit prices of each fixed cost pay item by the appropriate quantity and then multiplying the total cost of all pay items by the appropriate adjustment factor. Note: The adjustment factor is not applied to Accelerated Repair because it is a lump sum cost for accelerated mobilization regardless of it being on a weekend or at night. All JOC contracts include the option for a mutually agreeable one year term extension. The contract may be extended under the original terms and contract prices for a maximum contract term of two (2) years. The district should contact the BCS section by November 1 to evaluate and discuss whether the JOC should be renewed. Is the district satisfied with performance of the contractor? Are the existing bid prices reasonable? Is it the right business decision to renew the contract? If the option for extending the contract is exercised by MoDOT, a change order will be issued to extend the contract to the new term limits. The following are the guidelines for extending the term of a Job Order Contract for an additional year for a maximum two year term. In order for the contract to be extended, the project must contain the language in the Term of Contract JSP that allows for a one year extension. 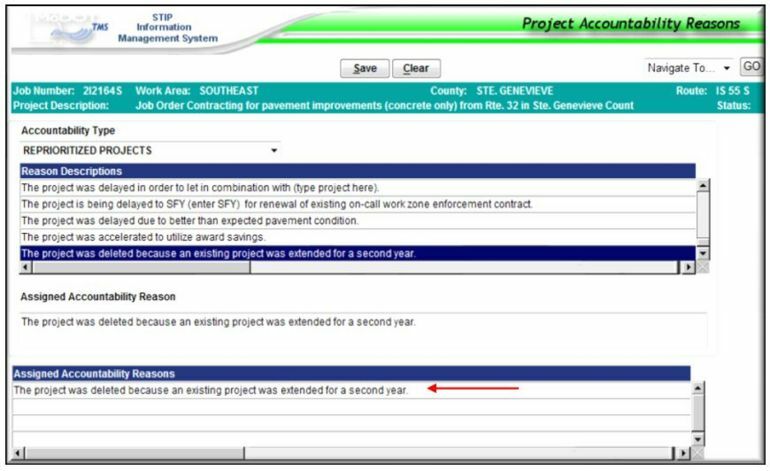 If MoDOT desires to renew the contract, the contractor will be given written notification (e-mail is acceptable) of the extension no later than December 1 of the current contract year. The contractor shall provide written notification (e-mail is acceptable) of acceptance or rejection of the extension of the contract no later than January 1 of the current contract year. 1 Text in red indicates information that must be supplied by the users themselves. The agreed letters or emails from both parties should be on file as supporting documentation to the time adjustment change order. A final quantity change order will be issued after completion of the second term. The RE must notify the contractor that the performance contract bond shall be increased to an amount equal to the original contract amount plus the extended contract amount (i.e., the original bond amount is generally just doubled). This can be accomplished by issuing a rider to increase the original bond to the new anticipated contract amount, or by issuing a new bond for double the original contract amount (i.e., if the original contract is $2 million, an increase rider should be issued for $2 million or a completely new bond for $4 million). A change order to increase the contract amount is not necessary because the new performance bond becomes part of the executed contract. The RE should scan the new performance bond and save it to the project file in eProjects. The paper copy of the new embossed performance bond should be submitted to the Division of Construction and Materials for storage with the original contract. The RE should submit an email request to Chief Counsel Office (CCO) for review of the new bond. The email should include the contract ID, the reason for the review (JOC extension), and separate links to the new bond, the original bond and the signed change order for the one-year extension. a. Current project numbers being extended. b. Future project numbers in the STIP that will not be let because of extension. c.	The source and funding split-out of each project. Indicate if SWIMB (Statewide Interstate and Major Bridge), district-funded or other FFOS. JOCs that will not be extended should be closed out in Site Manager at the end of the first year contract term. JOCs that are extended will be closed out in Site Manager at the end of the second year contract term. The district shall close out the contract following the Closing JOC Contracts guidelines below. Any JOCs that will not be extended should be closed out in Site Manager at the end of the first year contract term. Renewed contracts are closed out in Site Manager at the end of the second year contract term. Check the actual cost charges to make sure they are correct and request journal vouchers from Financial Services for corrections. Proceed with final close out in Site Manager. The contract budget adjustment will occur after the contract is complete. Interstate JOCs: If the contract is extended and an interstate project, Planning will credit the district with 2 years worth of Statewide Interstate and Major Bridge (SWIMB) funds rather than one year. Non-interstate JOCs: Contact Central Office Planning Programming managers because there may be specific issues regarding funding. Budgeted Amount and Cost Overruns. It is important to understand that the Bid Total in the front of the contract is not the budgeted amount. The Bid Total is only used to determine the winning bidder. Reference the CONTRACT AWARD section of the Job Special Provisions to determine the budgeted amount for the first year term of the Job Order Contract. For contracts that are not extended into a second year term, the Resident Engineer is authorized to expend up to that budgeted amount in the first year without issuance of a change order to increase the budgeted amount. If the contract has an optional second year term, and both parties are in agreement to extend the contract into the second year, the RE is authorized to expend two times the budgeted amount over the two-year term without issuance of a change order to increase the budgeted amount. The budgeted amount for the first year can be exceeded in the first year as long as the contract is extended to a second year and you do not exceed 2x the budgeted amount. If there is a need to increase the budgeted amount (one year or two-year), the RE shall issue a Level 4 change order prior to ordering the work, except that emergency repairs such as guardrail and guard cable shall not be delayed due to an unexpected overrun of the budget. Non-Fixed Cost Pay Item. These are items of work for which a description and fixed cost is not set forth in the pay item list. Payment for non-fixed cost pay items will be determined in accordance with [Sec 109.4.2, 109.4.3, or 109.4.4. Non-fixed cost pay items will be paid using an Adjustment Factor of 1.000. The approval level for non-fixed cost pay items shall be as indicated in EPG 109.12 Change Orders except that the Budgeted Amount shall not be exceeded without approval from the Chief Engineer. Contract Extensions. See EPG 147.3.5 Term Extension of Job Order Contracts for guidance on extending a JOC to a second year term. Per EPG 109.12.4, time adjustment change orders require division level approval, but when a JOC includes a provision that allows a one-year time extension, approval can be made at the district level. File the agreed letters (or emails) from both parties for supporting documentation in eProjects. If a time extension past the second year becomes necessary for any reason, contact the CM division for approval prior to issuance of a change order. Final Change Order. Upon completion of the Job Order Contract, a final change order should be issued to adjust the final contract amount to equal the total of all Job Orders issued during the term of the contract. This page was last modified on 25 February 2019, at 09:37.